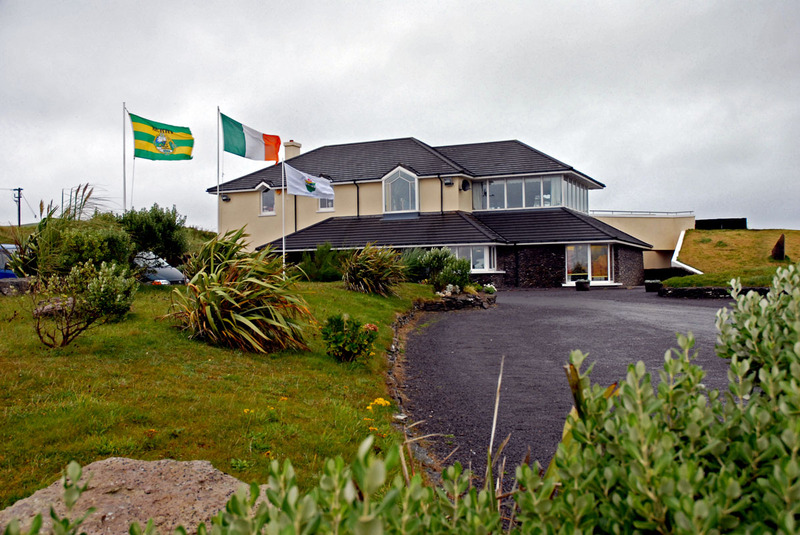 The Dingle Peninsula was festooned with Kerry flags when I visited. The county known as The Kingdom had just triumphed for 35th time in the All-Ireland Gaelic football championship. The Kingdom’s colours of green, white and gold decorated every house and pub, every car and pedestrian. Gaelic football is serious religion in these parts. Leaving the distraction of football celebrations behind, I headed west a few miles to Ballyferriter. Just beyond this village the hills sweep upwards to the cliff peaks known as The Three Sisters. Nestled beneath them is the most westerly golf course in all of Europe, the 6,696 yards, par 72 championship links of Dingle Golf Club, also known by its Irish name, Ceann Sibéal (Sybil Head). The Dingle peninsula is a Gaeltacht region, where Irish is the predominant language spoken by the local people. Every hole is named in Irish and all signs at the club are bi-lingual. 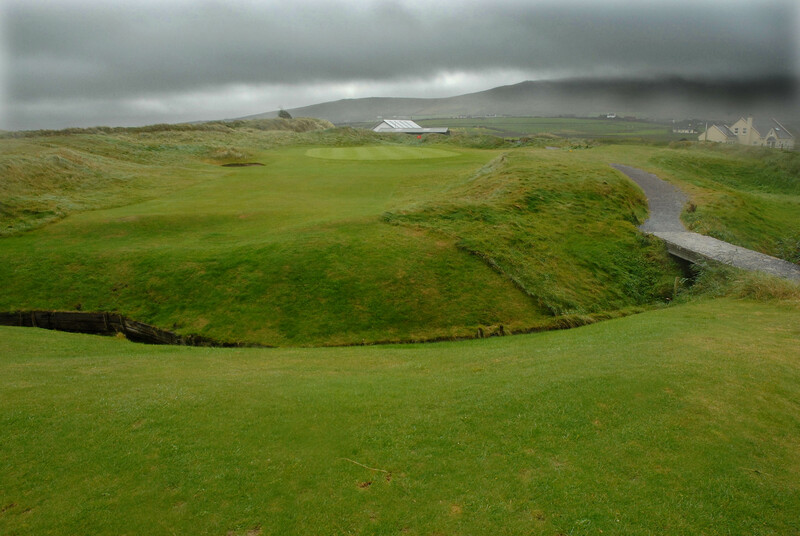 Dingle Golf Club was founded in 1924 and for many years they had a 9 hole course to the east of Dingle. In 1970, the legendary Eddie Hackett was summoned to design a new course at Ballyferriter. Eddie was renowned for his ability to make courses fit the landscape, rather than have bulldozers change landscapes to suit courses. Dingle was no exception. Later changes in the nineties were done by Christy O’Connor Jnr. There are no great towering dunes or yawning valleys at Ceann Sibéal. You won’t back off in fright at your first glimpse. Every hole is visible from the clubhouse. The course has a gentle, pastoral look, but don’t be fooled; this is a links full of subtlety. A burn (stream) threads inescapably through the twelve of the holes like a snake in the grass, with deadly consequences for a good card. I asked marketing manager John Slye for the name of this watery irritation but there is no proper name, it is just known as The Burn. There are plenty of names the members use, all unprintable. You may want to add to the list by the end of your round. It was a soft day as I stood on the first tee at the highest point of the course, looking down on an inviting par four. It is a straightforward 400 yard hole until you near the green and your first meeting with the burn as it meanders through a deep gorge across the front of the green. If you go for the green you have to make it because the steep bank in front will send any timid shot backwards into the water. Like nearly all the greens in Dingle, it is big and undulating, and true. The second is a 200 yard straightforward par three with bunkers left and right of the green. There is space here to run in from the front. Finding the fairway on the par four 3rd is all important as the ubiquitous burn winds its way up the right. A large green receptively slopes towards you here but too much club could put you into the houses at the back of the green. The 4th is another par four with out of bounds on the right and the fairway keeping to the right. Caution is advised here as a good drive could easily find our old friend the burn at 280 yards. You could make a big splash in a buggy here as there are no little side walls on the narrow bridge to keep you straight! Dingle is a fairly open links. There is hardly a tree in the area so I was surprised to hear the club has a state-of-the-art leaf-blower. Apparently it is useful for blowing the grass from the bunkers after the boundaries are trimmed! The par five 6th has a good carry off the back tees and trouble all the way on the right where a series of ponds await a careless fade. Otherwise, this is a straightforward hole and a good par opportunity. The next hole, a par four, will make you work for a score as you avoid trouble all the way along the right of this slightly doglegged index five. Keep middle to left of the fairway but if the prevailing winds blow, a par here will be well deserved. The ninth hole is called “An Ifreann”, Irish for hell! This long index one par four is a great hole, with water cutting the fairway diagonally about two hundred yards from the back tees. Staying left helps here but you will still have long way uphill to reach the green at the clubhouse. Laying up could be a wise option as the green slopes severely to the right and landing on it is no guarantee of staying, despite its generous size. A big dip awaits to the right to pull you well off the green. The par three 10th is the only real blind shot on the course. Looking out on a fine view of Smerick Harbour and Clougher Head, the flag is barely visible 190 yards away and it is all carry. The prevailing westerly wind makes for a good test and out of bounds left adds to the challenge. The 11th is a good par five with our old friend the burn crossing at 283 yards, very reachable, especially downwind. With trouble all the way a par here is a good result. Jeff Howes redesigned the par three 12th, an uphill 155 yards that is well guarded by bunkers. The green will kick the ball right here. “Crosaí’s Corner”, the par five 13th, is named after green keeper Muiris Crosaí whose family home is near the corner of this dogleg. The burn crosses the hole twice and with 240 yards minimum to carry the corner, a three shot strategy is wise here. Uphill to the green, with out of bounds all along the right, this is no easy par. The par four 14th is all downhill and this makes it fairly short. Plenty of trouble around the green with the burn cutting very deep on the left. The 15th is a 410 yard par four. The burn winds up the right for the first half of the hole and then you are faced with out of bounds left. Accuracy off the tee here is a must and to make the two tiered green in two. The relatively short 16th, a 366 yards par four, has plenty of trouble on the left and again crosses the burn, which is reachable down the left. The green is wide but fairly shallow and it is easy to overshoot into some mean bunkers and deep rough. Despite the killer slopes on this green, I find it hard to believe the story that one lady member took twenty three putts on this two tiered green! One of the toughest holes on the course is the par four 17th. The burn crosses at 270 yards and then there is a line of fairway bunkers guarding the approach to the green. Plenty of trouble around the backward sloping two tiered green makes this a tough hole where a bit of luck would not go astray. The finishing hole, a par five just over 500 yards is uphill to the clubhouse. A really good drive is needed here if you want to carry the grass fairway bunkers 70 yards out from the green in two, otherwise a lay up is wise. A deep pot bunker guards the left of the enormous green where a three putt is not out of the question. As you ramble around, look out for the choughs that inhabit the course. These glossy black members of the crow family are distinguished by their red legs and beaks and they are a cherished feature of the course when they are not digging up tees looking for grubs. They tend to be quite tame and have little fear of golfers. Wind is the dominating factor in this part of the world. You could play Dingle forever and it would never be quite the same as the last time. What visitors call a gale, locals describe as a “gentle Zephyr”; links players are accustomed to a bit of wind. In Dingle, it blows in from the bleak Blasket islands across Ferriter Bay and sweeps up Slea Head, sweeping the exposed course in its path. If you get a calm day be grateful, but do not expect it. Remote it may be, quiet it is not. Dingle is a thriving, bustling, cosmopolitan town. Everything is geared for the visitor. You will find music in the pubs every night of the week, with audiences from every corner of the globe. You could not be lonely in Dingle. This is a place where people like to talk and sing and dance and they embrace strangers enthusiastically. When you leave, take the Connor Pass road to Tralee. It is a slower route, a mountainous road, but worth every minute you delay for the spectacular views.